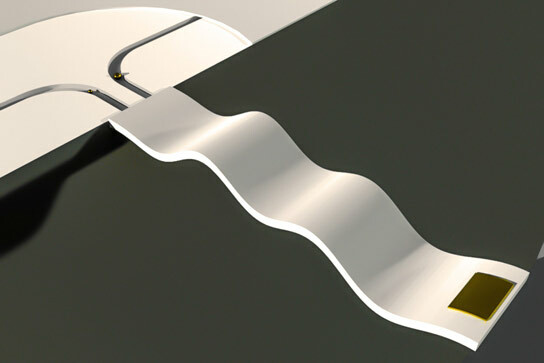 Using a suspended microchannel resonator, researchers can measure the relative positions of tiny particles as they flow through a fluidic channel, potentially offering an easy way to monitor the assembly of nanoparticles, or to study how mass is distributed within a cell. This animated image demonstrates multiple vibration modes. The top panel depicts a cantilever simultaneously oscillating in its first four vibrational modes. The bottom left panel shows a particle flowing through the microfluidic channel integrated into the cantilever. Next to that is an animation of the four vibrational mode shapes. The bottom right panel demonstrates the deviations of the resonant frequencies of these modes. Be the first to comment on "Suspended Microchannel Resonator Measures Nanoparticles As They Flow"